Are You Ready for Living Well Month? Here is one of several graphics you can find on the NEAFCS website in the “graphics library” and under Public Affairs tab under the Living Well tab. 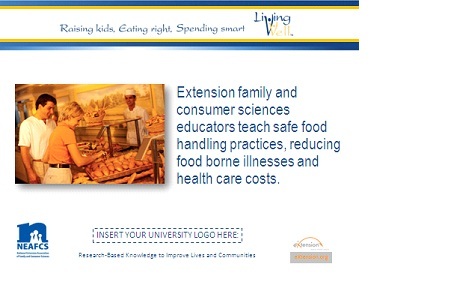 Here is another resource-one slide from a set of slides about Extension FCS programs. These are great for inserting into Powerpoint presentations! Check them all out to see what suits your needs! Need I say more? We have some wonderful resources for you for Living Well month. What a terrific NEAFCS membership benefit this is!